Johanna Morrow collects leaf samples from plants in the Bond Life Sciences Center’s growth chamber. Morrow is a Ph.D. student in the Liscum lab. 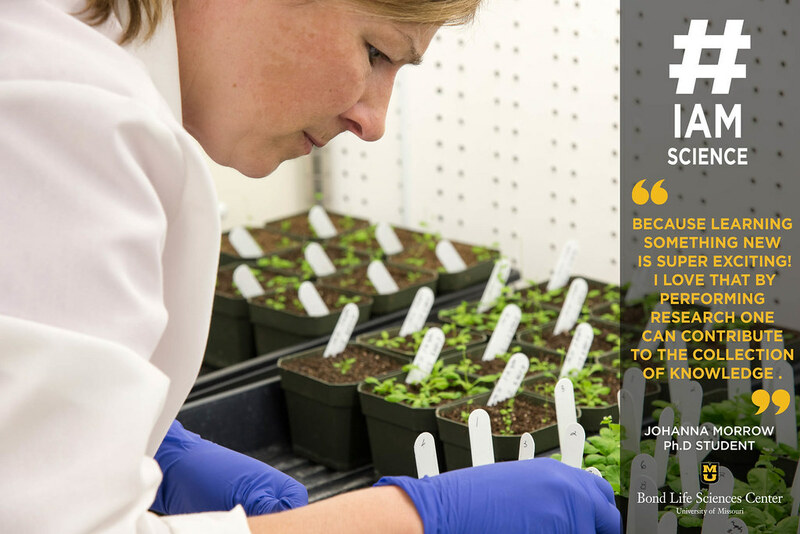 Johanna Morrow discovered her love for plant sciences after working in Mannie Liscum’s lab for more than a decade after college. Her love for research brought her into the lab, but once she was there she discovered another interest. “During the time that I worked in the lab, I found that not only did I enjoy doing bench work, but I found that I also enjoyed mentoring students and watching their passion for plant science and research flourish,” she explained. This realization led Morrow to go back to school so she could share her love of science with more students. Now her passion is her reality. Morrow is working on how plants sense and respond to different types of light. She deals with mutations in the model plant Arabidopsis. She hopes by screening different variations of the plant, she can better understand what happens to a plant after it perceives light. “Maybe we can identify new players in this mechanism or identify new ways that this could have an agronomic impact,” Morrow said.